A certain kind of fluorescence, performance-lecture and three-channel video presentation. 14 min 40 sec, SFMOMA, April 2018. Courtesy of SFMOMA. 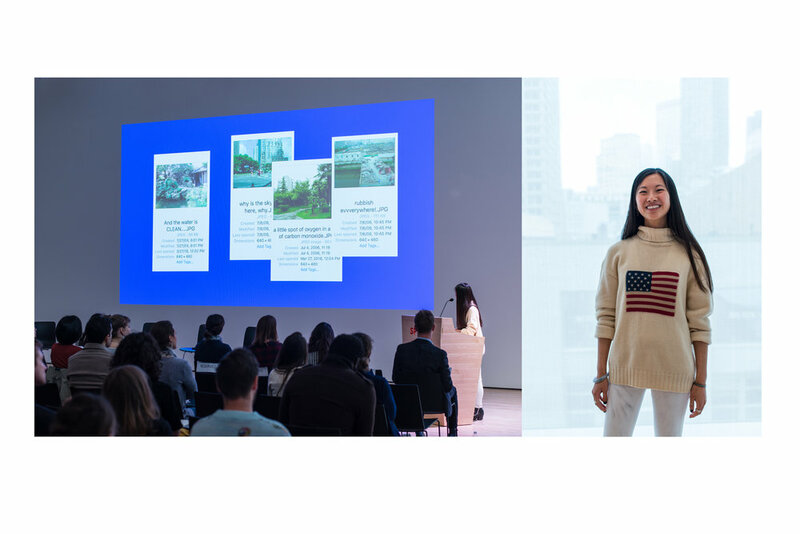 Originally delivered for the “A Line in the Sand” symposium at SFMOMA in April 2018, this is a performance lecture and three-channel video presentation that seeks to link into a broader set of concerns around cultural and environmental colonization, as well as the relationship between ecology and U.S. imperial concerns. In this performance, I use my position as a Chinese-born American to examine and interrogate a U.S. media-mediated reading of Chinese “toxicity” and pollution, while also observing the migration of the media image, linkages between environment and body, and the troubled boundaries between interior and exterior spaces. A certain kind of fluorescence (video still), performance-lecture and three-channel video presentation. 14 min 40 sec, SFMOMA, April 2018.